Bridget Jones’s Diary – Did You See That One? Bridget Jones (Zellweger) is looking for ways to improve herself in hopes of giving herself a better life. While she stumbles awkwardly through life, she details her thoughts and feelings in her diary. 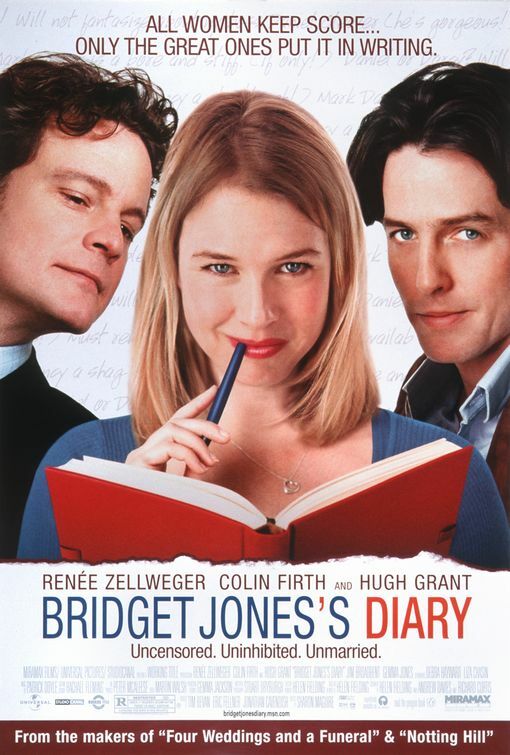 This romantic comedy is based on the hit novel “Bridget Jones’s Diary” which was written by Helen Fielding (Bridget Jones: The Edge of Reason) and published in 1996. The adaptation was written by Fielding along with Andrew Davies (House of Cards) and Richard Curtis (Notting Hill). The movie was directed by Sharon Maguire (Incendiary). The cast for this film includes Renée Zellweger (Cold Mountain), Hugh Grant (About a Boy), Colin Firth (The King’s Speech), Shirley Henderson (Harry Potter and the Chamber of Secrets), and Jim Broadbent (Cloud Atlas). This film is based on a book of the same name, written by Helen Fielding. The story is a cross between a coming-of-age tale and a romantic comedy. The romantic comedy side is definitely the dominant genre in the writing though. As far as R-rated comedies go, this one seems to suffer from the same problems as most of them. (Especially when it’s a romantic comedy.) The aspects of the film that make it R-rated just don’t pay off. There’s a sense of a need to be overstated or crass to make a point that falls pretty flat. There also seems to be a push to make Bridget a bit off-putting, which works almost too well. That’s unfortunate considering the real humor found throughout this one. There are some great laughs based entirely on the unique situations written into the story. The good and the not so good just about even out in this one. The acting in this one is pretty good. Renée Zellweger earned an Oscar nomination for Best Actress for her work as Bridget Jones. (This was the only nomination for this film.) She does a great job bringing the awkward Bridget to life. She’s also able to make the right adjustments to show the growth of her character throughout the story. She’s got two leading men to work with in this one. Colin Firth and Hugh Grant both have nice parts in this movie. They both have good chemistry with Zellweger, and they manage to bring out the right amount of animosity between their two characters. Shirley Henderson and Jim Broadbent are just two of the remaining cast members who make this one pretty fun. Overall, the acting does good work despite some weaknesses in the writing. Like most romantic comedies, this one doesn’t offer much in terms of groundbreaking visuals. It’s still a nicely made movie that doesn’t suffer from any production issues. The costumes do add something fun to moments throughout the film. All things considered, this is a decent movie that will entertain most rom-com fans. If you’re a fan of the stars, I think you might enjoy this one. Zellweger, in particular, does a nice job bringing her character to life. I would also suggest this to anyone who loves romantic comedies. I give this one 2.6 out of 5 stars. I give this movie 0 out of 5. I respect your decision, counselor. Good review, but I think this is a better film than your review suggests. It plays all the right beats for its audience. Some cynics might sneer at its over sentimental, heightened state, but we don’t come to these films for kitchen sink realism, we’re here to escape it. I don’t think it works quite that well. They made her into a character that I didn’t want to root for. With romance I expect to want more for the main character. I think you’re probably in the majority on your feelings about this one. Thanks for checking out my review. You’re welcome. You’re running a fine blog here. This is a very funny movie. Regardless of if people call it a chick flick, or not. Good review. Thanks. I think most people liked this more than I did.